HICO SBG-200CL 3/4" HP 8" 205mm Heavy Duty Bench Grinder is powered by a 3450 RPM induction motor, providing superior power and making it ideal for larger and longer grinding applications. Constructed with a rugged cast iron base and motor housing grinder offers optimal durability and prolonged life. Features precision machined aluminum tool rests which allows users to accurately position work, rear exhaust ports in wheel guards for smoother operations, and a 12-1/2" distance between wheels. 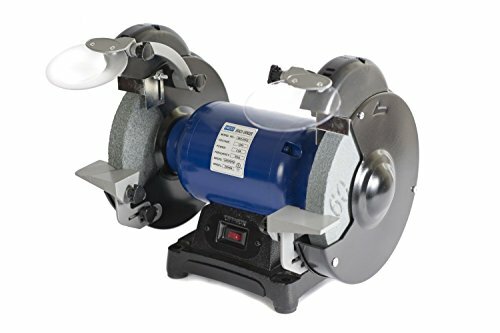 This grinder is conveniently designed for a variety of applications such as grinding, industrial sharpening of blades, knives, chisels or other cutting tools, easily handles the hardest metals and most abusive applications, removes rust, shapes, polishes, grades and much more. 36 grit wheel, 60 Grit wheel, eye shields, spark deflectors, tool rests and adjusting wrench included. HICO was originally founded in 2000, and specialize in designing and manufacturing high quality tools in the industry.The company owns a unique range of products for woodworking, which include the power tools, lawn & garden tools, universal workbench, and also a full series of spare parts at the professionl level, After over 14 years's operation under the sophisticated management, HICO has not only achieved the leading level in the industry, also gained its reputation of high creativity and reliability. Today, the HICO products have been supplied to numerous customers worldwide, and all well-received by each consumers. If you have any questions about this product by HICO, contact us by completing and submitting the form below. If you are looking for a specif part number, please include it with your message.